It looks like one of Leesburg’s most storied traditions will take place under clear skies in a crisp fall weather tonight. 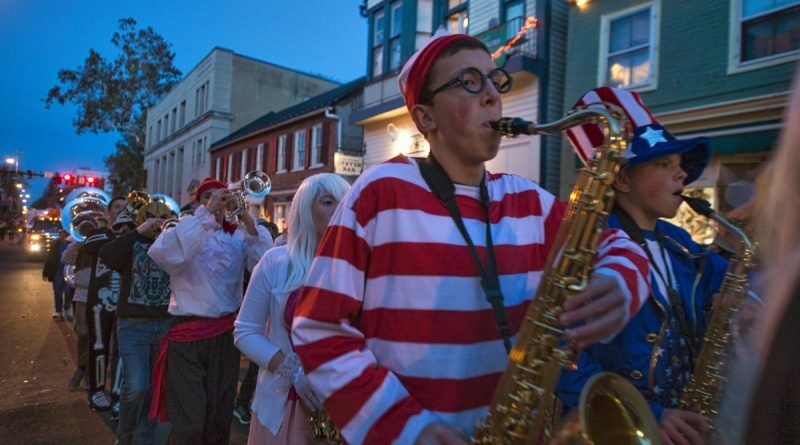 The 61st annual Leesburg Halloween Parade, hosted and organized by the Leesburg Kiwanis Club, will begin at 6 p.m.
One of the oldest Halloween parades in the eastern U.S., the parade will start at Ida Lee Park and proceed down King Street to Fairfax Street. The parade annually draws thousands of spectators to downtown Leesburg to watch the procession of community groups, businesses, bands and, especially during election season, lots of political candidates. King Street will be closed from Battlefield Parkway to Fairfax Street from 5:30 to approximately 8 p.m. on the night of the parade. Parade spectators are encouraged to bring food donations for Loudoun Hunger Relief. A list of most needed items can be found at loudounhunger.org. Parade-goers should pay particular attention to three snow plows decorated by local students and can cast their vote as to their favorite. Students from C.S. Monroe Technology Center and Smart’s Mill Middle School decorated three snow plow blades for the 3rd annual “Paint the Plow” public art project. The theme for this year is “The Wizard of Oz” and the three entries are: The Emerald City, by C.S. Monroe; There’s No Place Like Home, also by C.S. Monroe; and Follow the Yellow Brick Road, by Smart’s Mill. Members of the public can vote on their favorite design through midnight Saturday, Dec. 9. The Friends of Leesburg Public Art will present the winning school with a $100 prize. To cast a vote and see photos of the painted blades, visit surveymonkey.com/r/painttheplow2017. In addition to tonight’s parade, the painted snow plow blades will also be featured in the town’s Christmas & Holiday parade, scheduled for Saturday, Dec. 9.